Despite a seemingly limited control set, this 'finishing EQ' delivers fantastic results. Very musical, ear-catching tone shaping. M/S option in the Master plug-in capable of extra width and stunning detail. Extremely simple control set which delivers great results, fast! You'll want to use another EQ for your multi-band needs. 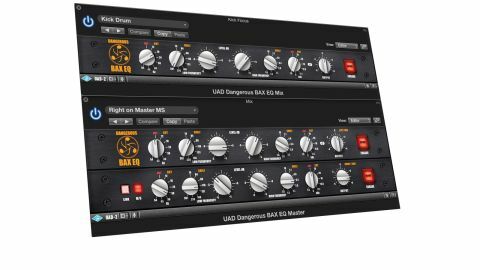 The Dangerous BAX EQ Collection has been developed for the UAD-2 platform by Brainworx. It features two processors: EQ Mix and EQ Master, the latter of which is only available for stereo tracks and, as their names suggest, they've been designed for single-instrument and whole track use respectively. Both are modelled on Dangerous Music's hardware which, in turn, takes its inspiration from a tone-shaping design developed by Peter Baxendall in the '50s. The control set for the Mix plug-in is very straightforward, bearing in mind the power and range of treatments it can produce. You're greeted with a high-pass filter with detents at 12, 18, 24, 30, 36, 43 or 54Hz, allowing you to scoop out sub-bass to provide extra headroom. The Low Frequency dial then provides shelf EQ, with a -5dB to +5dB dial controlling frequencies ranging from 74Hz to 361Hz. "We tested both variations of the plug-in on a wide range of sonic material and we couldn't find a sound it didn't make a significant difference to"
The High Frequency equivalent provides shaping between 1.6kHz and 18kHz, before a low-pass filter completes the tone- shaping options, switchable from 7.5kHz up to 70kHz. An Output control completes the feature set, whilst an Engage button provides signal bypass to compare results. The Master plug-in provides true stereo operation of the same concept, showing as a virtual 2U processor but otherwise featuring the same controls as its counterpart. It goes further, however, by allowing you to link the two channels for a single-set control that will equally affect both sides of the stereo picture or, with the Link button disabled, independent control over both sides. Additionally, it's possible to enable a Mid-Side matrix, whereby the top control strip shapes the tone of the mids and the lower concerns itself with processing the sides. This is extremely powerful, as you can perform any tasks from scooping sub frequencies from the sides to radically increasing the perceived 'width' of the mix. We tested both variations of the plug-in on a wide range of sonic material and we couldn't find a sound it didn't make a significant difference to. The sonic differences between processed and unprocessed sounds are frequently subtle but this is partly because the effects produced are so musically pleasing. It's possible to tailor sub frequencies or low mid-range without signals becoming bloated, just as it's possible to add air to a vocal, guitar, or a whole mix, without results becoming over-bright or too 'hi-fi'. As the control set is relatively niche, this is definitely an EQ to consider primarily if you have your multi-band EQ needs covered. But as both an emulation of the Dangerous hardware and as a specialist EQ tool, there's nothing not to love about it.